Recent Construction, very functional, very quiet, nearby (5 minutes walk): the village centre and its shops, bus stop between Les Allues and Meribel, the cable Olympe (direct access to the ski area and resort centre). Small but cozy apartment. Excellent location within walking distance of gondola. Deborah was very responsive. The unit was clean and had everything we needed for a three night stay. We loved our stay here, perfect for a couple looking to have a relaxing ski holiday. The apartment is a short walk from the bubble that takes you straight to merribel centre. Very friendly and welcoming hosts. Ideally situated on a quite road but within easy walking distance to the bus stop. The chalet is tastefully furnished and decorated to a high standard. Although compact you will find everything you need to make your stay enjoyable. The chalet is warm, has a comfortable bed and lots of little extras to make you feel at home. The views are amazing! The free buses run frequently making all areas of the resort accessible and run late enough for you to enjoy an evening out in Meribel centre. Unfortunately we ran out of time so didn't use the hot tub, maybe next time? Thank you to Deborah and Michael for being excellent hosts. I would highly recommend a stay here. The welcome and gifts by the lovely owners Deborah and Michael was a super start to an excellent week. The property is compact, but comfortable, cosy, and has everything you need. There is great off street, under shelter parking. The free ski lift or regular free bus to Meribel Centre is only five minutes walk away, be it uphill on the way home. The village store is five minutes away too, with a great selection of essentials, with more in Meribel. If you want somewhere to ski all day and a lovely, quiet, place to settle your head at night, this is the perfect place for you. With a lovely warm dry boot room below the property, with heated boot rack and plenty of storage for your skis. There is a wealth of tourist information in the studio, and if you need more Deborah is a dictionary herself. The jacuzzi was a lovely ending to to the day on the slopes. We hope to be back soon!! Fantastic week in les Allues! Merci encore à Deborah et Michael! We had an incredibly lovely stay in their studio flat in les Allues. 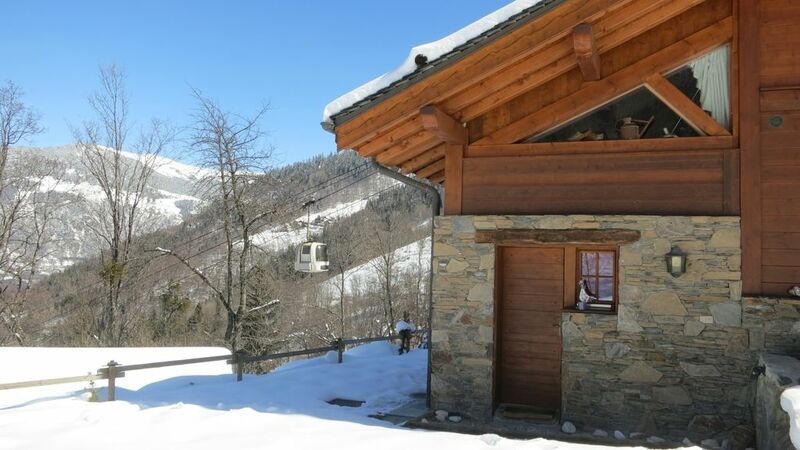 The studio is well maintained and part of a beautifully built wood chalet. It is a small space but there is everything you need. The kitchenette is clean and well stocked, the bed is incredibly comfy - exactly what you need after a long day of skiing! You have access to secure ski storage and drying racks. The access to the transfer gondola up to Méribel Centre is a 5 minute walk away. The combination of the transfer gondola and the free Méribel shuttle bus make it incredibly easy to access the village from the resort. The shuttle bus and regional bus stop are also very close by (less than 5 minutes). There is a grocery store and ski rental shop in les Allues. We ended up extending our stay as there was snow in the forecast which conveniently was no issue at all. Deborah and Michael were very welcoming and helpful hosts, we loved staying at their place and would highly recommend their studio! The Studio is located a short walk from the Gondola that leads to the base. There are no lockers or storage at the Gondola stop and it is just a tad too far to walk in ski boots so we drove and parked at the Gondola stop each day. It is walk-able, 5-10 minutes, but uphill at the end of a long ski day made it easier to drive and there is ample parking. The Chalet itself was cozy and comfortable with sufficient cooking supplies and a small refrigerator. The owners are very friendly and helpful. The Jacuzzi was great after a long day on the slopes. We enjoyed our stay and would recommend the chalet for those looking for a quiet spot on the mountain with easy access to the slopes.